I see so many sewist (seamstresses, sewer, stitcher, fabric manipulator, or how ever you define yourself as someone who sews) asking questions and being really nervous to make something with swim/ performance fabric. Well, I hope I can help with some questions and concerns associated with sewing swimwear or performance apparel. When sewing swim knit, I use the same (well mostly the same) sewing techniques as I do for the standard knits. I haven’t had to change my serger settings other than the tension on my left needle in my serger. I went up 1 # from (made it tighter) the right needle on my usual setting. 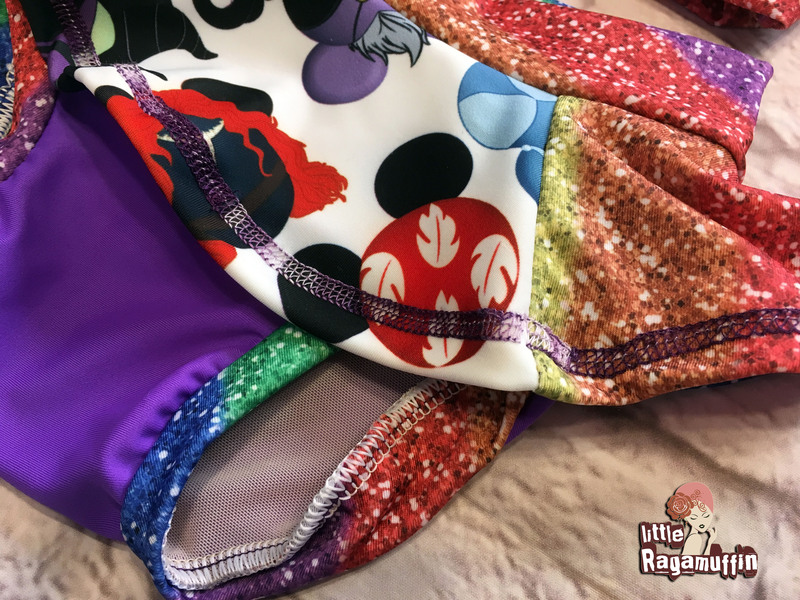 I found this to be helpful so that the seam still has the stretch needed for swim, but will keep that pesky left thread from “smiling” through your seam. You can see my post, basic tips for knits, to check out my serger settings. *Note- Every sewing machine/ serger is different. Even if you are using the same brand/ model as I am. The tension discs that your thread sits in can become worn or clogged with lint over time and basically those numbers on the discs can become useless. (I have 3 sergers, 2 are the same brand and all 3 have different tension settings to get the same results) Go with what works for your machine. These are just suggestions based on my machine and what works for me. If you aren’t sure about your tension/ settings, always do a test on scraps of the fabric you will be sewing. Your standard sewing machine will have a stretch stitch, lightning stitch, and or zig-zag stitch. Check your machine’s user manual for the best stretch stitch option. Always use the longest stitch length your machine has, and your tension should be set pretty low. My standard machine is 0-9, 9 is the most tension, I have it set to 3 or 4 for knits. In my opinion your choice in thread can make a huge difference in your sewing experience. I prefer the maxi lock brand. I use the basic maxi lock in my needles and maxi lock stretch thread in the loopers of my serger and in the bobbin of my standard machine. I know the slickness of swim is an issue, and can be daunting to tackle. Like all things it is a learning curve and just takes a little practice. Pins and clips are your friend. Just be sure to use ball point pins and be sure not to serge over them <– Yes, I have done that and it isn’t fun. For fun top stitching, either with your twin needle or coverstitch, I love variegated thread, Maxi lock swirls. Since these can be somewhat pricey, I only get one. If I need a second spool for my twin needle, I simply wind a bobbin and use that as a second spool for my twin needle. When using it for a roll hem I only put it in my upper looper. You defiantly want high quality swim fabric. Cheap ( not as in price, but quality) fabric will only make your sewing life harder than it needs to be. When ordering online, look for Medium Weight and avoid light weight or drapey descriptions. Sewing with good quality fabric will also cut down on the dreaded curled edges. 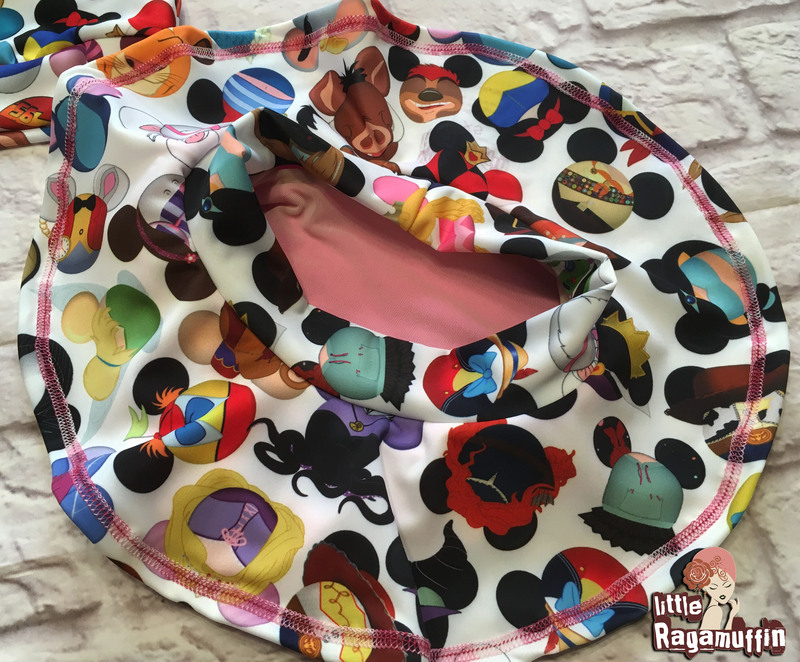 I have found that cutting and sewing right away also helps the edges from curling as you sew. Leaving cut knit for days before sewing will cause the edges to curl. Here is a list of places I like to buy my swim fabric and lining. Power mesh has less stretch and usually is a bit thicker than standard lining. It will allow for more support, I like it in the tummy area and I add a layer in my bra cups for ladies swim. 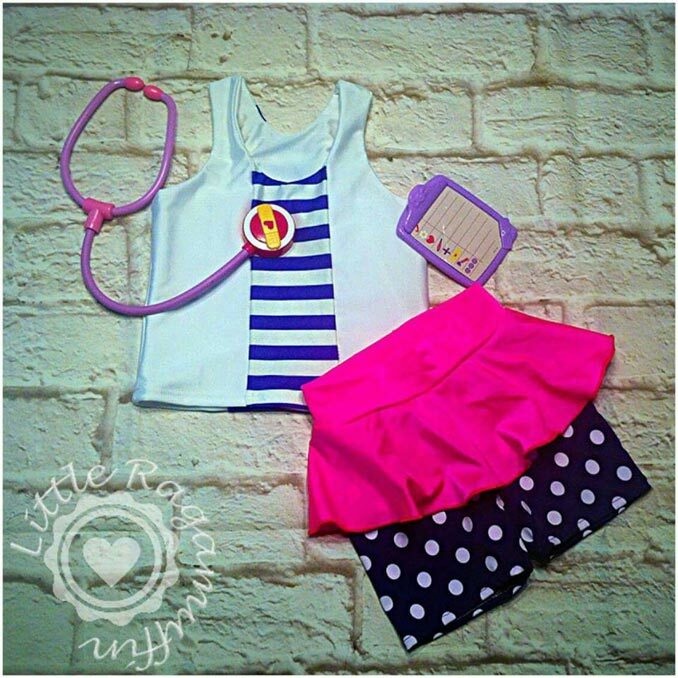 For kids swim or area you my not need the extra support go for the standard lining. You will want to line anything you don’t want to “show” when wet. Sometimes I use solid swim colors to line my swim wear if I don’t have any lining around. This works in a pinch, but depending on the pattern you may get extra bulk, so I don’t recommend it for every application. You need SWIM elastic. Yes, it is different than standard elastic. It is made to hold up in chlorine and other harsh chemicals used in pools. If you use standard elastic, you will find it becomes brittle looses its elasticity after a few dips in the pool. Packages of swim elastic– good for one or two suits depending on the size and style. Roll of swim elastic– This one is a better price /yard. 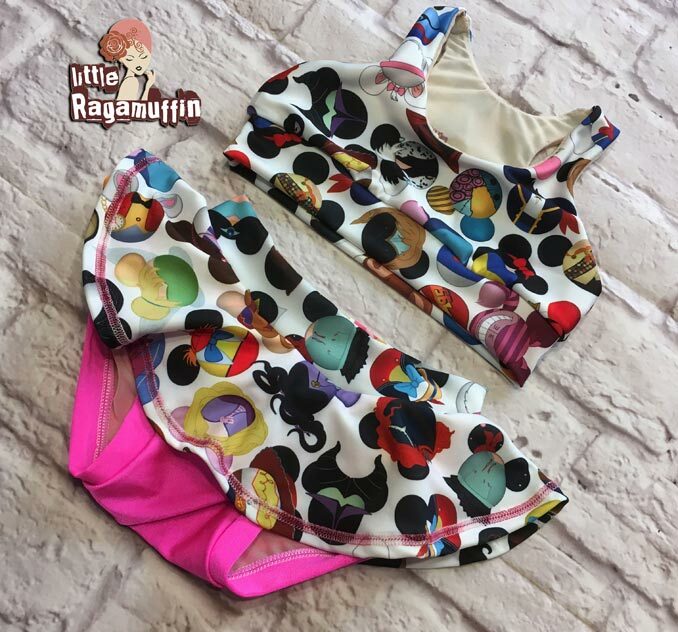 Since I have 3 kids + myself to sew swim wear for, this one is the best options for me. Not only is it cheaper/ yard, but you won’t end up with those weird small cuts at the end of the package you just can’t use- Money wasted! This is tutorial for serging elastic into a waistband, but the technique is the same for leg holes or any place you are adding elastic. These are optional in most patterns, I recommend them. You can make them removable or sew them right into your swim lining. To sew them into your lining, center them evenly on the sides and pin in place. Then you can zig-zag around the edges. Using power mesh as your lining in the bust area will provide extra support as well. I like foam bra pads/ cups because they provide support and the much need extra coverage. If you want your pads removable, I have a tutorial for that. You may have to do a little adjusting depending on the pattern you are using. But the concept is still the same. 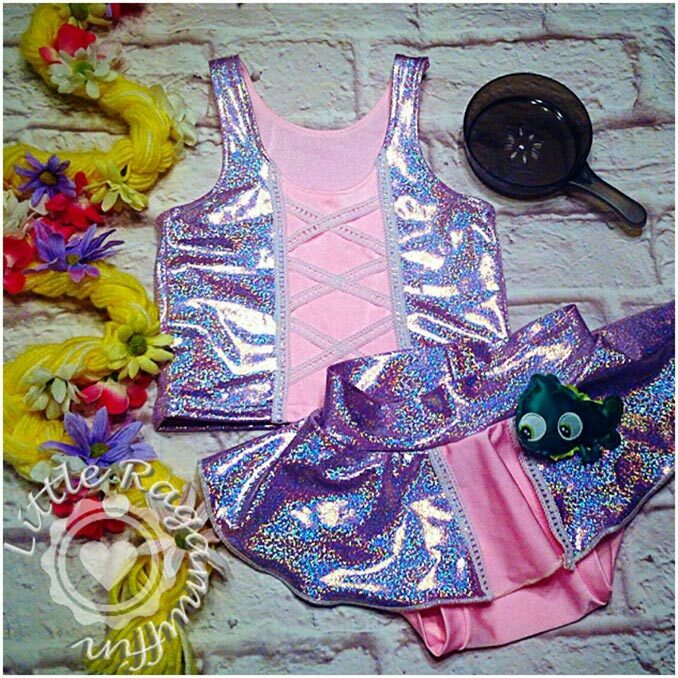 Swimmy Suit – This is by far my favorite kids suit!! Best part is there is no swim elastic!! And it has tons of options. see pictures below for some inspiration. Join me in my facebook group. Did you know I have a shop? Yes, you can order you very own Little Ragamuffin Original. This is great! Thank you! 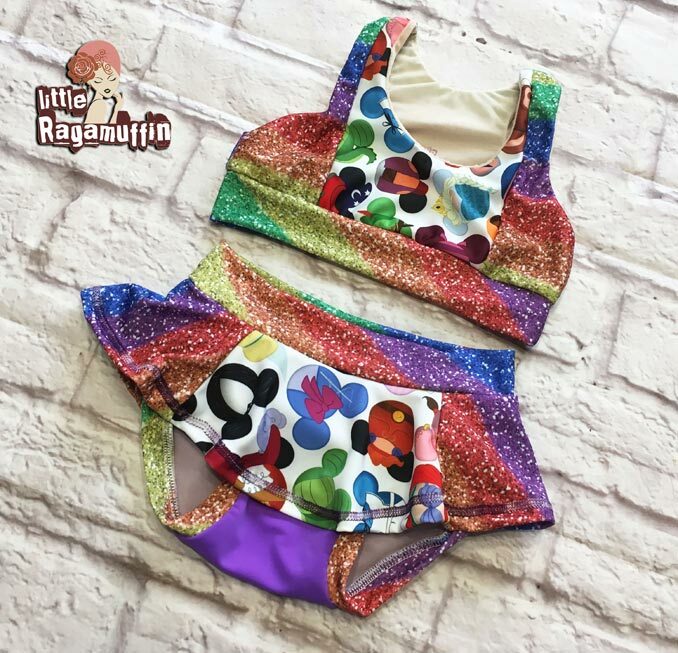 For the decorative gen stitches on the Mickey head swim suits can that be done on a serger or was that done on a cover stitch? Thanks! I used a cover stitch for the hems on the skirts. You can kinda fake it with a zig-zag stitch. Hem with a top zig-zag, then go back over it with a second top stitch using a twin needle. Some standard machines will have a faux coverstitch setting that mimics the look of the coverstitch. Can you hack a regular tight fit pattern into a swimsuit? I want to use the scrundlewear fo bottoms.